I sincerely apologise for the duplicate question. I'm not sure how to add to the discussion on the original, and I don't have enough reputation to leave comments. 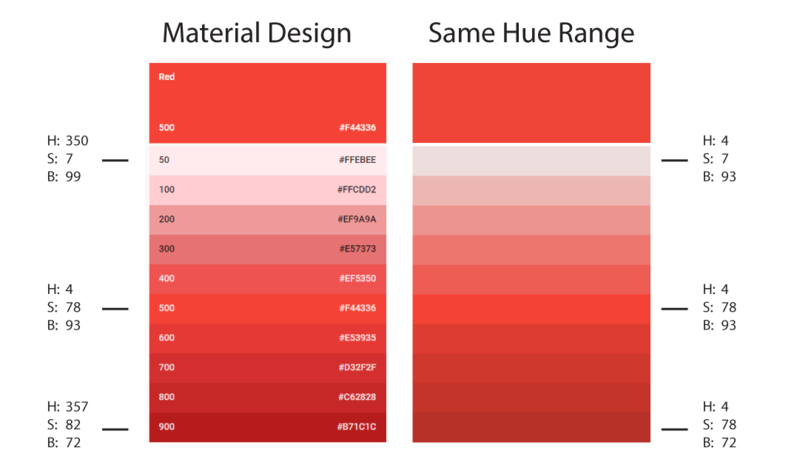 Here is the original question: How to choose the right color shades/tints for branding? There is quite a big difference and the Material Design colors have a much more pleasant range. I want to gain a deeper understanding of just exactly the process they have to get these results? I presume they must have some kind of tooling to achieve the correct perceived color. In my opinion, you should not use only the HUE to make a color gradient. Take a look at this answer. Some colors look dirty when they are graded to white or black, at least we perceive it like that. In my opinion, this approach of making a gradient based only on arithmetical operations is wrong, or at least, not optimal. In fact, you can read how they shifted the HUE making these compensations of hue. Our eye perceives colors in a bit different way. For example, in this gradient you posted, our eyes perceive more the differences on the bright side than the dark one. Other related posts: How can I make the color white look as white as possible? Not the answer you're looking for? Browse other questions tagged color-theory color-reproduction google-material-design or ask your own question.